The 19th century palace of Palais Epstein is situated in one of the most prominent and exclusive locations of Vienna: Right on the Ringstraße, between the Natural History Musuem and the Houses of Parliament. When this part of the Ringstraße was under development in the 1860ies, the "Adelscasino" was meant to be built here - a club and congregation facility for the Austrian-Imperial nobility as a counter-point to the Hofburg Palace and the Parliament as the representatives of court and people. However, the piece of land was too expensive - which, looking at the enormous wealth of the Austrian nobility at this time, means quite something. So the little stretch of land was purchased by a member of a new group on the Austrian society: The rich entrepreneur and banker Sir Gustav von Epstein. The Jewish businessman originated from Praque hired the most famous of the Rinstraßen architect, Theophil Hansen, to design a fancy city palais for Vienna for him. He chose the style of the Italian Renaissance for the historicist design, the building was completed in 1870. One year later, Epstein retired from his company since he suffered from cancer, and withdrew to his palace where he spent a lot of time, money and dedication on the interiors. 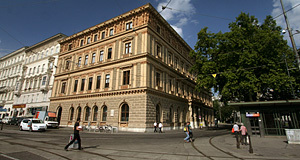 Palais Epstein also became home to the extensive art collection of the highly successful entrepreneur. In 1873, the Gründerzeit boom had reached a climax and the over-heated market went beyond the top in the course of the "Weltausstellung" (World Exhibition, modelled after the Great Exhibition of Kensington, London) - a crash at the stock exchange ruined the traditional Epstein Bank. The treasurer of Epstein, Adolf Taussig, lost not only a lot of money of the bank, but also his private fortune - he committed suicide by jumping out of a window in the top-floor of the Palais Epstein. Gustav von Epstein himself had to move out of the Palais and rent an apartment near the Academy of Fine Arts, soon before he died from his cancer. In 1873, Palais Epstein was sold to an English gas corporation, who later sold it to Austria in 1902. After this, Palais Epstein was made an administrative building and became home to the Verwaltungsgerichtshof, an administrative court, later of the Stadtschulrat (Educational Council of Vienna) and the Bauamt (Urban Development / Construction Office). After the end of WWII, the head council of the Soviet troops moved into Palais Epstein, who stayed here for ten years between 1945 and 1955. After that, the Stadtschulrat moved back in and stayed until 2001, when Palais Epstein was generously refurbished and became adapted as a side-building of the Parliament. Palais Epstein is connected with the Houses of Parliament by an underground tunnel. More visibly to the ordinary tourist, the façade of the Palais is dominated by terracotta decorations and ornaments that refer to the Italian Renaissance. Out- and inside of Palais Epstein are in very good shape - only the interiors of Gustav von Epstein were mostly lost. Attractions nearby are numerous - Palais Epstein is at the most important section of the Ring after all. To name only those within a radius of a three-minute-walk: Houses of Parliament, Justizpalast, Palais Trautson, Volkstheater, MuseumsQuartier with several museums, Naturhistorisches Museum, Kunsthistorisches Museum, Hofburg, Bundeskanzleramt and Burgtheater.